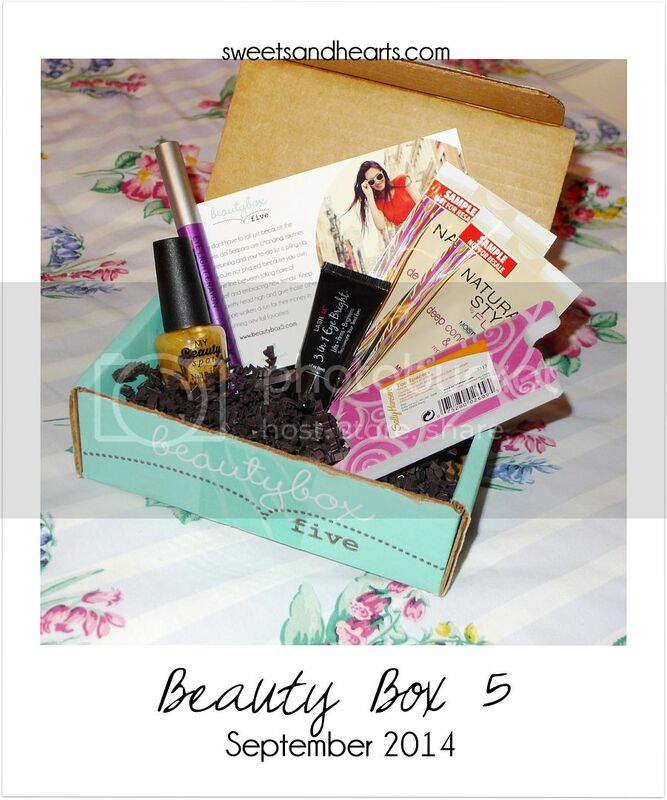 It's time to try some new products from Beauty Box 5--just in time for fall! I've been noticing that these boxes have a good variety of makeup and bath/body products. For the September box, I got to try another hair conditioner (been getting a lot of those lately! 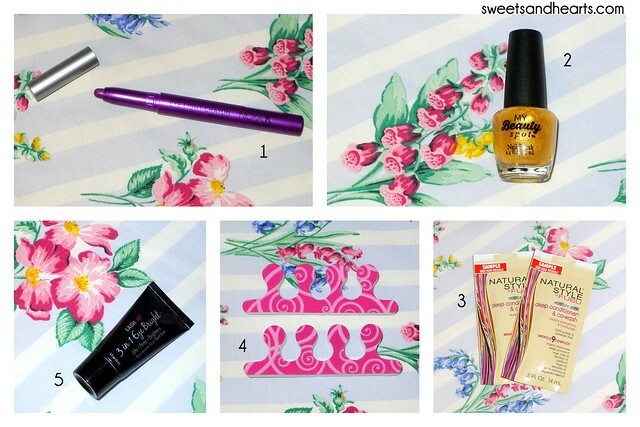 ), nail polish, eye brightener, eye shadow, and toe spacers. Nicka K New York - Eyelight Crayon - Purple is probably my favorite non-neutral eye color to wear. I liked that this creamy eye shadow stick was really easy to use, and it glides on nicely. It's pretty sheer, so I'd recommend pairing it with a dark eye liner. See below. My Beauty Spot - Nail Polish - This nail polish comes in sets of 6 (I got to try a shimmery pale gold shade) and would make a great gift. It goes on easily and smoothly, and looked great with just two coats. The pearlescent finish was very pretty. See below. Natural Style by FUBU - Deep Conditioner & Co-Wash - This deep conditioner is made without sulfates or parabens (yay!) so I was excited to try it. It made blow-drying my hair easier and smoothed it out pretty nicely. 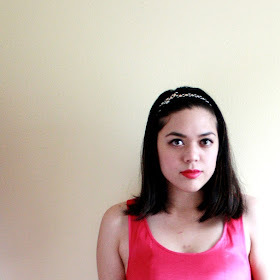 However, it did weigh my hair down a bit. It's probably best to use if your hair needs a conditioner that's extra moisturizing. Sally Hansen - Toe Spacers - Inexpensive and cute, these toe spacers are a must-have basic for your pedicure set! Chrislie Formulations - 3-in-1 Eye Bright - I've only been using this for a few days so I can't comment on its effectiveness quite yet, but I do like the gel formula. It absorbs fast and you only need to dab on a little bit under each eye. It's supposed to make you look more awake by firming the skin and reducing dark circles. I don't suffer from dark circles, but my eyes do get puffy when I haven't had enough sleep, so I'll let you know if I end up liking this or not.